Last week was a little busy, from a social standpoint. On the 17th we attended Chefs in a Garden, an annual fundraiser that supports Gateway Greening. Chefs from numerous venues in the area are charged with preparing a dish utilizing locally grown produce. The offerings are always unique, to say the least. The Four Seasons Hotel does a great job of hosting the event. Plus we all got designer water on our way out. 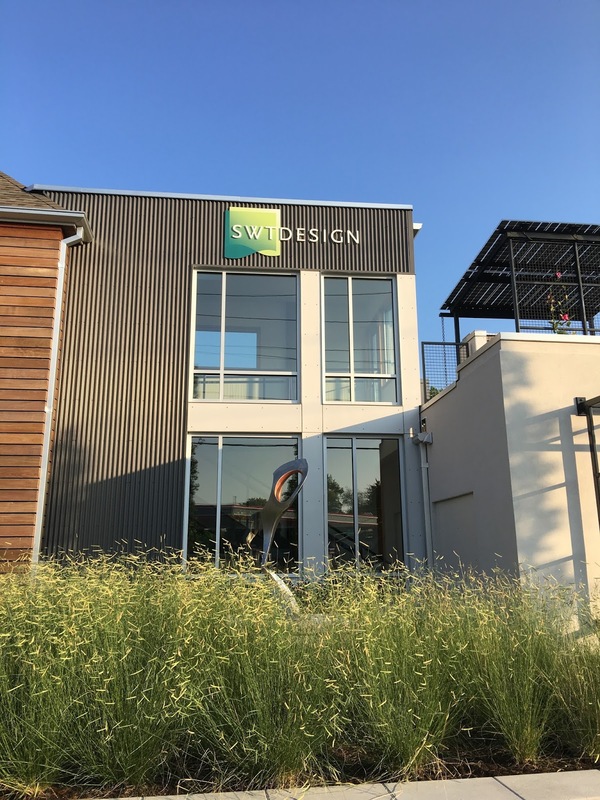 Tuesday was the SWT Design Garden party to show off the completed renovation of our third building. Though it was over 90 degrees outside, the shade and a slight breeze made it bearable. There was a nice turnout, though I had to leave around 6:00 to get back to our house as I had 15 women coming over at 7:00. The gal who started the Women in Focus photography group in St. Louis is moving to Las Vegas, so instead of our normal monthly meeting at the library, I had suggested having a going away party at our place. I had pretty much everything ready ahead of time. I just need to throw together the sangria I was making. I had just tied the balloons out front when the first guests arrived. Several people brought drinks or appetizers to share, so we had plenty of food and beverages. I had a cake made at Schnucks, and it turned out so cute! It was a bittersweet night as we will miss Tiffany very much. But we are excited to see what life brings her way in Nevada. Thursday I played pickleball in the morning, and then that evening I went to Forest Park for some pickleball drills. That was a lot of pickleball in one day, but I know I need to practice if I want to improve my game. Sunday I had breakfast with a friend to first of all catch up, but also to review the galleys of her new book. 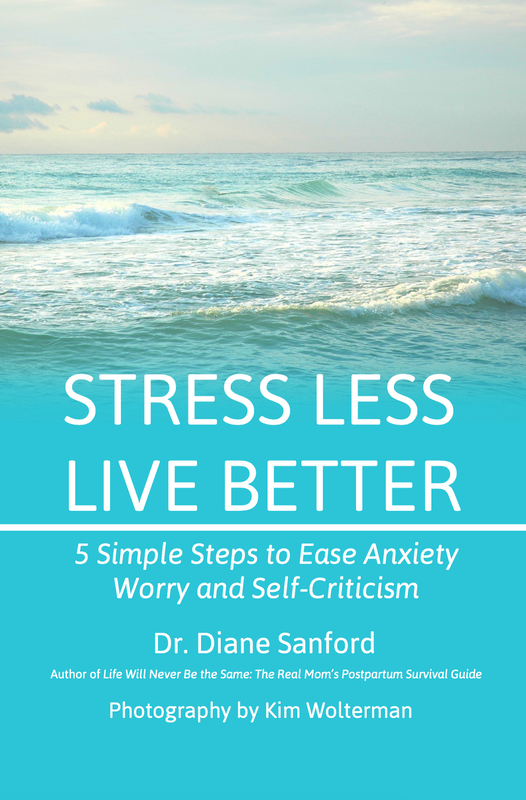 I provided the photographs for it, including a design for the front cover. The publishing company made a minor modification to the cover, and we both thought it looked great. Diane approved the cover weeks ago, so imagine our surprise and disappointment when the galley had the wrong cover on it! We also have some concerns about how the designer laid out some pages in terms of how the text interacts with the photos, but they may or may not take our critique under advisement. They are the publisher, after all. Hopefully they will at least address a couple of the bigger issues. I am eager to see the book in print, although it will be in black and white so the photos don't shine as much. The ebook version will be in color though, so that's cool. It is a pretty big thrill to see my name listed on the cover! Last night we attended a donor's event at the St. Louis Zoo to celebrate the new exhibit, Grizzly Ridge. The exhibit opens to the public on Friday, but donors got a sneak peak. 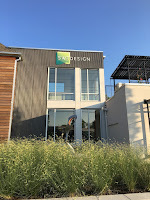 Jim's company, SWT Design, is not only a donor to the zoo but also was part of the design team for this project. It was a beautiful evening, and the donors came out in droves to see the two new grizzly cubs, Huckleberry and Finley. The two sibling cubs were left orphaned when their mother was killed in July of 2016 by Montana Fish, Wildlife, and Parks Service for being a menace to domestic animals and a threat to humans. The cubs were taken in by ZooMontana until the exhibit in St. Louis was recently completed. They could not keep the cubs as they currently have two adult males in their zoo, and they were concerned the males would not accept the youngsters. In the interim, they alternated the times that the bears were in the outside space so that the adults would never be in the same area at the same time as the cubs. I'm not sure exactly when the bears arrived in St. Louis, but they probably quarantined them for at least 30 days before letting them into their new enclosure. They were allowed in the outdoor space on Wednesday the 12th in preparation for their debut on the 13th. 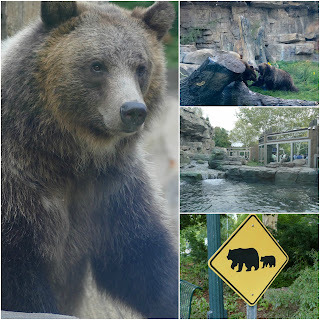 As mentioned above, the Centene Grizzly Ridge opens to the public on the 15th of this month. The new grizzly space is very nice, complete with a waterfall and pool for the bears to swim in. The glass surrounding the space allows ample opportunities to view the bears. But as someone who takes lots of pictures, I have to say that I miss the old space where glass did not interfere with photography. 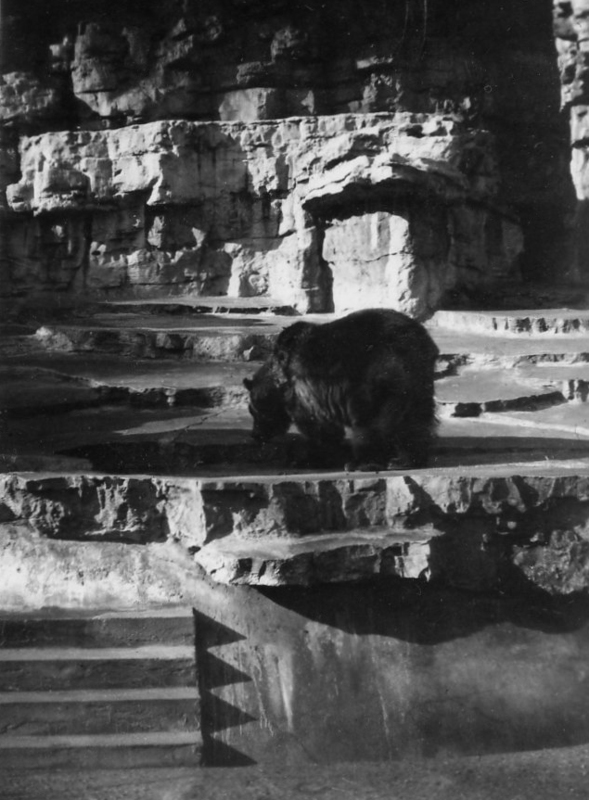 Just for fun, here's a photo of the bear exhibit that my father took in 1943 when he was stationed at Jefferson Barracks for training. Following a buffet dinner at the zoo, we were free to wander around a bit so we caught some of the antics of the popular polar bear. As it began to get to dark, we headed back to Living World to exit to our car. 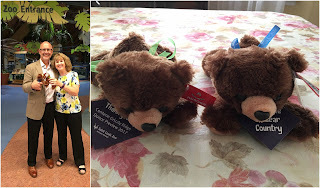 Everyone received a commemorative stuffed bear on their way out. It was so cute I could hardly bear it - ha! Last week our daughter flew into St. Louis with a co-worker, who happens to be from Kazakhstan. As I was unfamiliar with that country, I had to look it up. It is a central Asian country that used to be part of the soviet republic. One of the things that is so intriguing about where our daughter works is the fact that many of the employees are from other parts of the world. How wonderful to be exposed to all those different cultures! Jim and I took off for Iowa to visit his family. We had a very nice weekend getting caught up with his parents and sister. When we arrived back in St. Louis on Tuesday, September 5th the timing worked for us to pick the girls up at the car rental location near the airport. Early the next morning, we took them back to the airport to return to LA. While our time with them was short, we had a lot of fun. We have a heptacodium miconioides, or seven-son flower, shrub growing on the north side of our house. I've always enjoyed the late summer blooms and the peeling bark on this plant, but this year the shrub gave me another reason to love it. The painted lady butterflies have arrived in droves. In addition to all the bees, the plant is alive with color and movement. I've never seen anything like it outside of a butterfly conservatory. The beauty is very calming in light of all the devastation the hurricanes are causing throughout the world. I continue to pray for all of those affected by the storms.